Lab on a Chip and Dolomite are proud to sponsor the thirteenth Pioneers of Miniaturization Lectureship, to honour and support the up and coming, next generation of scientists who have significantly contributed to the understanding or development of miniaturised systems. 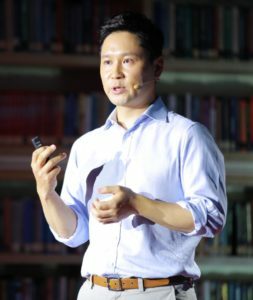 This year’s Lectureship will be presented at the µTAS 2018 Conference in Kaohsiung, Taiwan with the recipient receiving a prize of US$2,000. Early to mid-career scientists (maximum 15 years post completion of PhD). Scientists who have demonstrated outstanding contributions to the understanding or development of miniaturised systems. Full contact and affiliation details of the person making the nomination. A list of the candidate’s relevant publications or recent work (all work should be original). Candidate’s scientific CV stating PhD completion date; address; and full contact details. Who has won the Pioneers of Miniaturization Lectureship in the past? 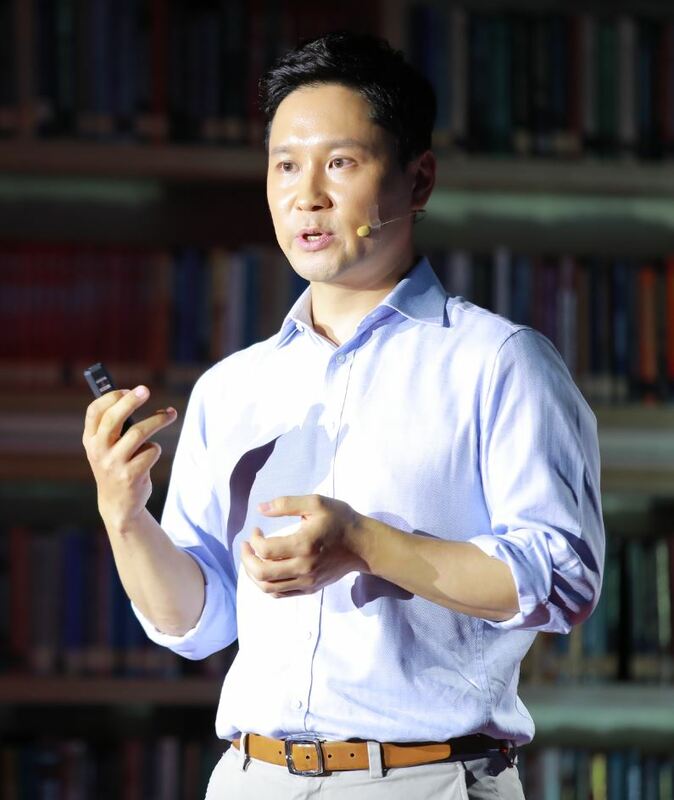 The winner will be expected to submit at least two significant publications to Lab on a Chip in the 12 months after the lectureship is awarded. The decision on the winner of the lectureship will be made by a panel of judges coordinated by the Editor, and this decision will be final. Lab on a Chip and Dolomite are proud to sponsor the twelfth Pioneers of Miniaturization Lectureship, to honour and support the up and coming, next generation of scientists who have significantly contributed to the understanding or development of miniaturised systems. This year’s Lectureship will be presented at the µTAS 2017 Conference in Savannah, Georgia, USA with the recipient receiving a prize of US$2,000. Scientists who have demonstrated extraordinary contributions to the understanding or development of miniaturised systems. The award is for early to mid-career scientists (maximum 15 years post completion of PhD). The award is for extraordinary or outstanding contributions to the understanding or development of miniaturised systems. This will be judged mainly through their top 1-3 papers and/or an invention documented by patents/or a commercial product. Awards and honorary memberships may also be considered. Dolomite Microfluidics has grown to be the world leader in the design and manufacture of innovative microfluidic products. Modularity, ease of use and scalability are common to all Dolomite products, which are used across a broad range of applications in biology, drug discovery, chemistry, food, cosmetics and academia. Dolomite is a world leader in Productizing Science™ which means creating marketable and commercially successful products from scientific discovery. Dolomite is a part of the Blacktrace group of companies. Pioneers of Miniaturization Lectureship 2016 – nomination deadline approaching! Lab on a Chip and Corning Incorporated are proud to sponsor the eleventh Pioneers of Miniaturization Lectureship, to honour and support the up and coming, next generation of scientists who have significantly contributed to the understanding or development of miniaturised systems. This year’s Lectureship will be presented at the µTAS 2016 Conference in Dublin, Ireland, with the recipient receiving a prize of US$5,000. The decision on the winner of the lectureship will be made by a panel of judges, and this decision will be final. The leading journal for miniaturization at the micro and nanoscale. Lab on a Chip supports research and development of miniaturization technologies and promotes interdisciplinary co-operation across all fields of science. The Journal also provides readers with a more fundamental understanding of miniaturization and related processes as well as the necessary tools for practical application of methods and devices. Who has won the Pioneers of Miniaturisation Lectureship in the past? 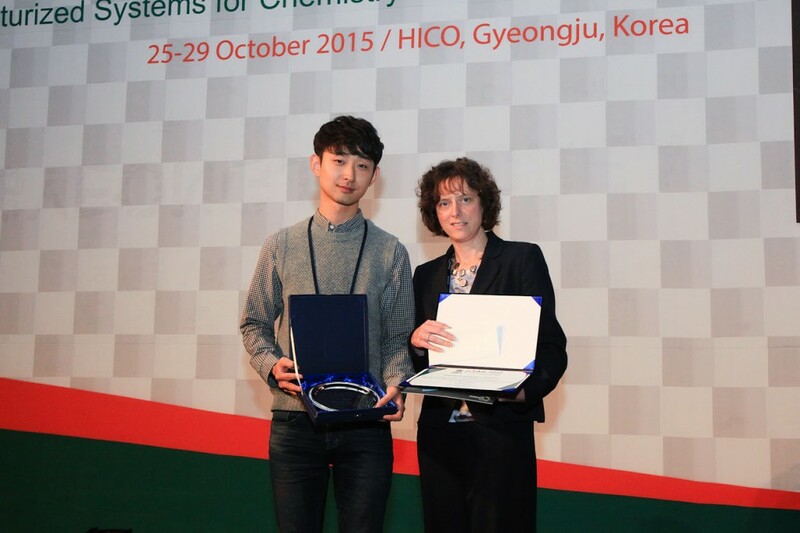 The µTAS 2015 Conference was held in October at the Hwabaek International Convention Center in Gyeongju, Korea. Sarah Ruthven, Executive Editor of Lab on a Chip, was in attendance at the conference to announce the prestigious Lab on a Chip awards which include the Pioneers of Miniaturisation Lectureship (in partnership with Corning Inc), the Widmer Young Researcher Poster Prize, the Art in Science award (sponsored by NIST) and the µTAS video competition (in partnership with Dolomite Microfluidics). 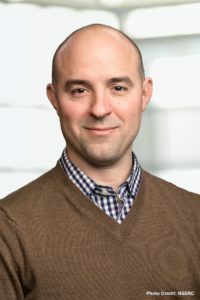 Professor Dino Di Carlo was announced as the winner of the 10th “Pioneers of Miniaturization” Lectureship, sponsored by Lab on a Chip and Corning Incorporated and supported by the Chemical and Biological Microsystems Society (CBMS). The “Pioneers of Miniaturization” Lectureship rewards early to mid-career scientists who have made extraordinary or outstanding contributions to the understanding or development of miniaturised systems. Professor Di Carlo received a certificate, a monetary award and delivered a short lecture titled ‘Microfluidic Frontiers’ at the conference. More information can be found on the competition blog. Left to right: Sarah Ruthven (Lab on a Chip) and Professor Di Carlo (winner). 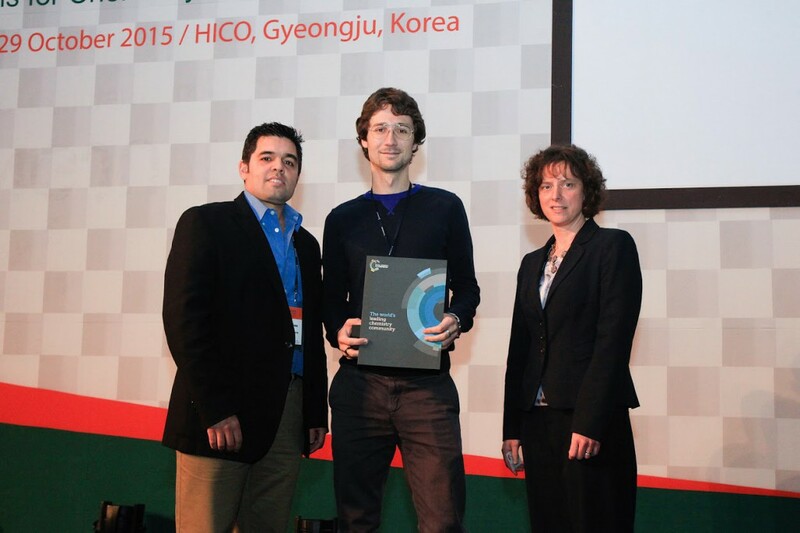 Lab on a Chip and the National Institute of Standards Technology (NIST) presented the Art in Science award to Matteo Cornaglia from the Laboratory of Microsystems, EPFL in Switzerland. The award aims to highlight the aesthetic value in scientific illustrations while still conveying scientific merit. More information on the winning photograph can be found on the competition blog. 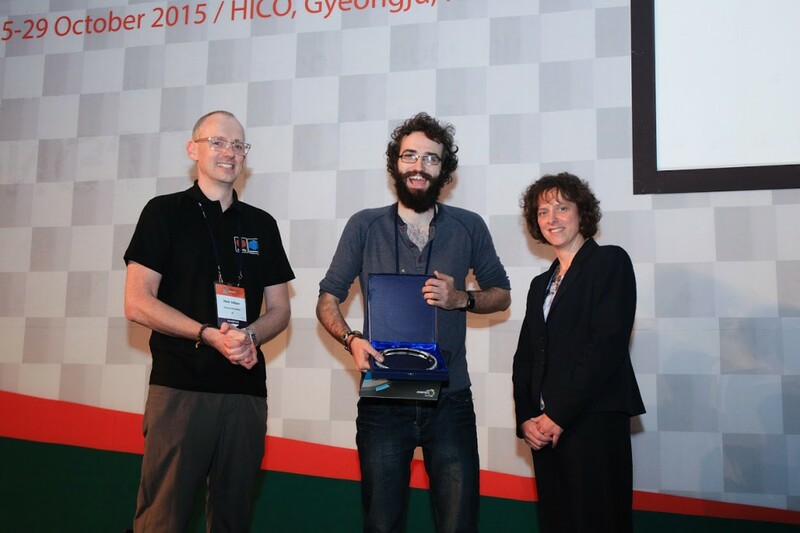 Left to right: Darwin Reyes (NIST), Matteo Cornaglia (winner) and Sarah Ruthven (Lab on a Chip). Lab on a Chip and Dolomite Microfluidics announced Dan Kirby and the Ducrée Lab, Dublin City University the winner of the 2015 µTAS Video Competition supported by the Chemical and Biological Microsystems Society (CBMS). µTAS participants were invited to submit short videos with a scientific or educational focus. The winners, the Ducrée Lab, recreated an 80’s music video titled “Spin me right round” to promote new areas of research in lab-on-a-disc platforms. The full video can be viewed on the competition blog. Left to right: Mark Gilligan (Dolomite), Dan Kirby (winner) and Sarah Ruthven (Lab on a Chip). The Widmer Poster Prize was awarded to Jinho Kim from Inje University, Korea, with a poster titled “Single-cell isolation of circulating tumor cells by microfluidic technology”. 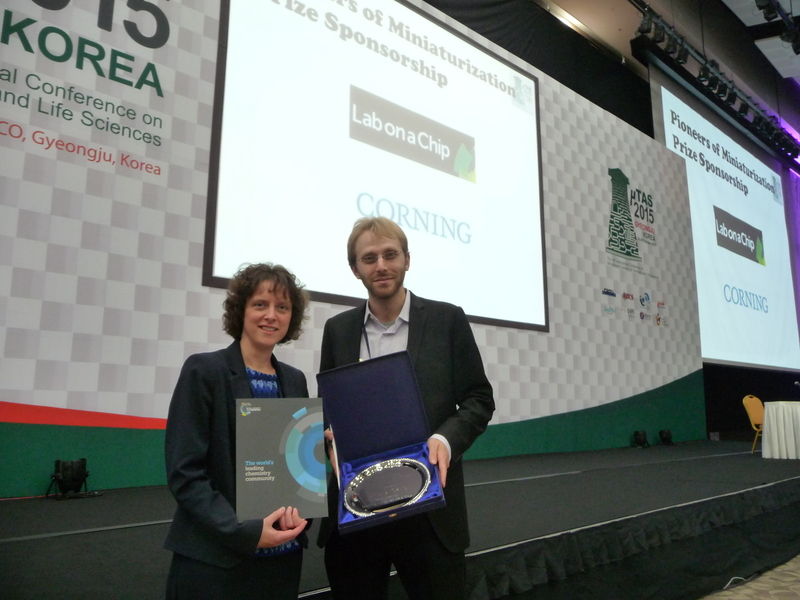 Left to right: Jinho Kim (winner) and Sarah Ruthven (Lab on a Chip). Congratulations to all the winners at the conference! We look forward to seeing you at µTAS 2016 in Dublin, Ireland. Lab on a Chip and Corning Incorporated are delighted to announce that Professor Dino Di Carlo is the winner of the 2015 “Pioneers of Miniaturization” Lectureship. The 10th “Pioneers of Miniaturization” Lectureship, sponsored by Lab on a Chip and Corning Incorporated and supported by the Chemical and Biological Microsystems Society (CBMS), is for early to mid-career scientists who have made extraordinary or outstanding contributions to the understanding or development of miniaturised systems. This “Pioneers of Miniaturization” Lectureship will be presented to Professor Di Carlo at the µTAS 2015 Conference in Gyeongju, Korea, 25-29 October 2015. Professor Di Carlo will receive a certificate, a monetary award and will give a short lecture. Professor Di Carlo received his B.S. in Bioengineering from the University of California, Berkeley in 2002 and received a Ph.D. in Bioengineering from the University of California, Berkeley and San Francisco in 2006. Professor Di Carlo is currently a Professor in the Department of Bioengineering at the University of California, Los Angeles, USA. 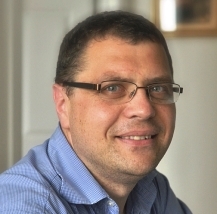 Professor Di Carlo’s current research aims to exploit unique physics, microenvironment control and the potential for automation associated with miniaturized systems for applications in basic biology, medical diagnostics, material fabrication and cellular engineering. 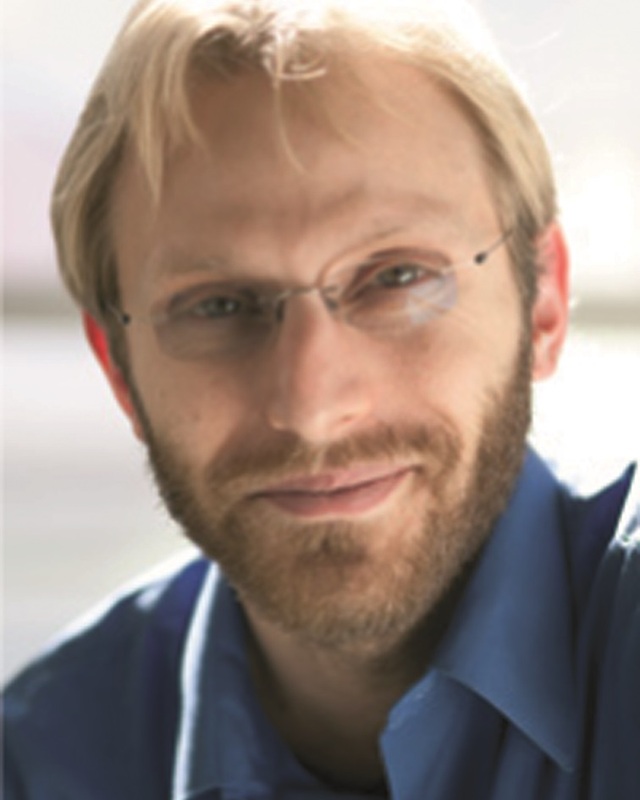 Among other honours and awards, Professor Di Carlo has been awarded the National Science Foundation (NSF) Faculty Early Career Development award and the U.S. Office of Naval Research (ONR) Young Investigator Award in 2012, the Packard Fellowship for Science and Engineering and Defense Advanced Research Projects Agency (DARPA) Young Faculty Award in 2011, and the National Institutes of Health (NIH) Director’s New Innovator Award and Coulter Translational Research Award in 2010. For more details on Professor Di Carlo’s research please visit his lab homepage. You are currently browsing the archives for the Pioneers of Miniaturization Lectureship category.